Top Row, left to right: Mrs. Buford Tracy; Mrs. J. W. Garrard, Principal; Truman Hayden, Superintendent; Ernest Willer. 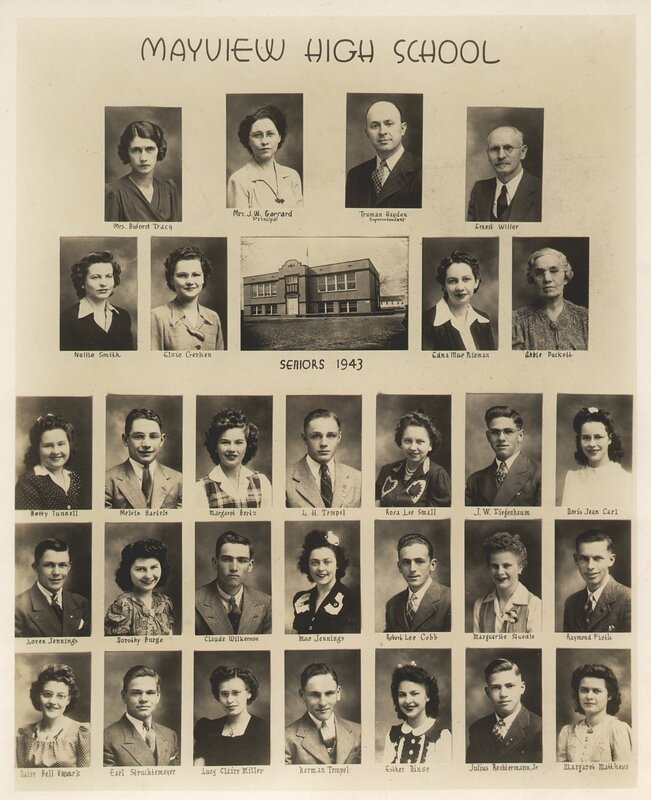 2nd Row, left to right: Nellie Smith; Elsie Gerken; photo of Mayview High School; Edna Mae Nieman; Abbie Puckett. 3rd Row, left to right: Betty Tunnell; Melvin Bartels; Margaret Bertz; L. H. Tempel; Rosa Lee Small; J. W. Fiegenbaum; Doris Jean Carl. 4th Row, left to right: Loren Jennings; Dorothy Burge; Claude Wilkerson; Mae Jennings; Robert Lee Cobb; Marguerite Stuedle; Raymond Fieth. 5th Row, left to right: Daisy Bell Vorwark; Earl Struchtemeyer; Lucy Claire Miller; Norman Tempel; Esther Dinse; Julius Rechtermann, Jr.; Margaret Matthews.